Let’s be honest, ladies.. Who doesn’t LOVE Brunch? Not only can you be super crafty when creating a menu, but it is also a completely acceptable reason to start cocktailing at 11:00 a.m. Hosting a brunch is also a perfect excuse to dress fabulously with all your girls and try out all of those recipes you have been collecting on Pinterest. 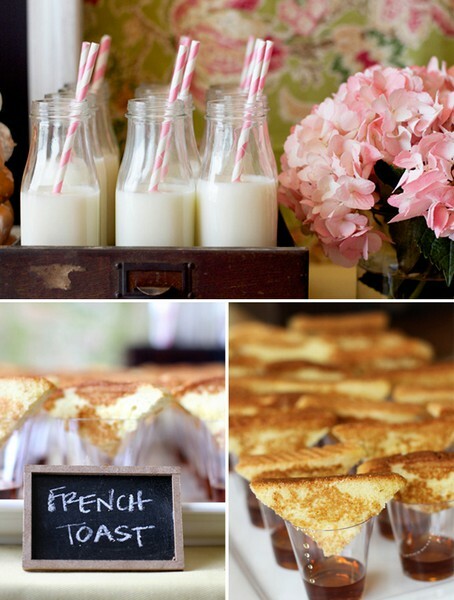 So whether you are hosting a shower, or a post bachelorette party gathering – here are some lovely inspirations to help you ease into hosting a brilliant, blissful brunch. 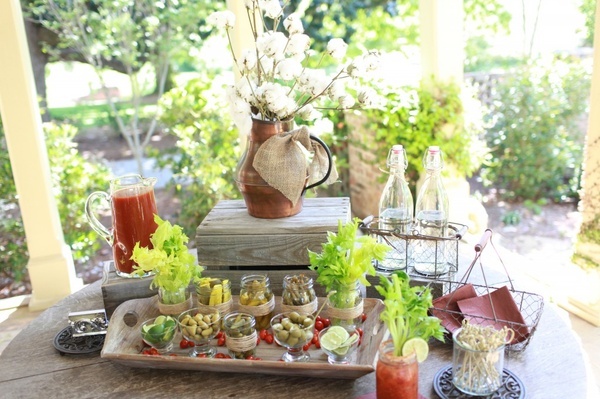 A Bloody Mary or Mimosa Bar is a fun way for everyone to have the option to make their concoction. You also have the power to be as creative with it as you want. 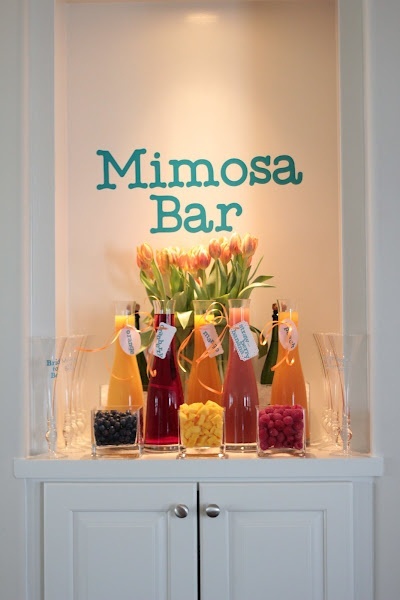 For those who are non-drinkers or do not prefer to start drinking before 1 in the afternoon – this infused water bar makes for a delicious and refreshing option. 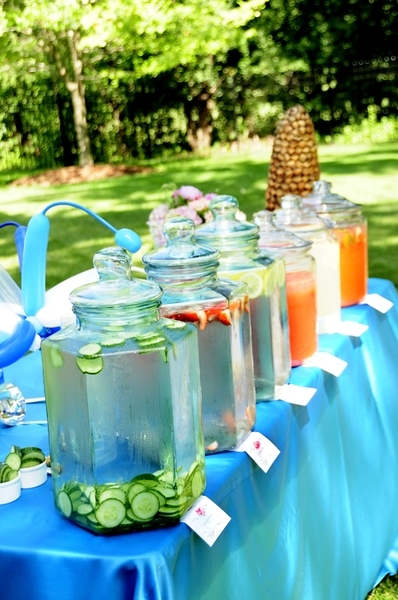 You could also do lemonade or an array of iced teas if preferred. Quiche, Biscuits, and a delightful assortment of seasonal fruits are just a few suggestions for hosting the perfect mid afternoon gathering. 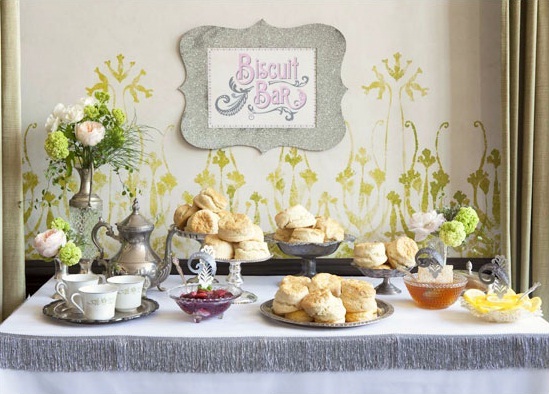 A biscuit bar loaded with honey and jam is an easy go to when hours of early preparation is not your idea of a good time. Many biscuit recipes can be made in advance and baked off before you need them hot and fresh. 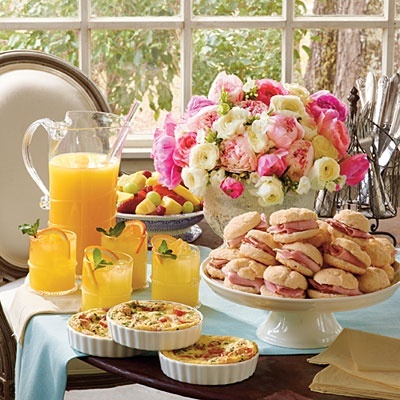 If you like what you see in the first picture then you absolutely have to check out this easy brunch menu compliments of Southern Living. For other great shower inspirations check out Hostess with the Mostess. Veggies are always a big hit and an easy go to. 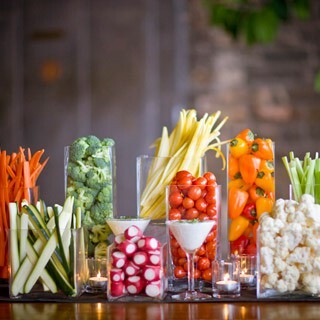 To make it more fun and festive try using vases for the veggies and martini glasses for the dip instead of a boring old platter. This is so simple to create and definitely easy on the eyes. 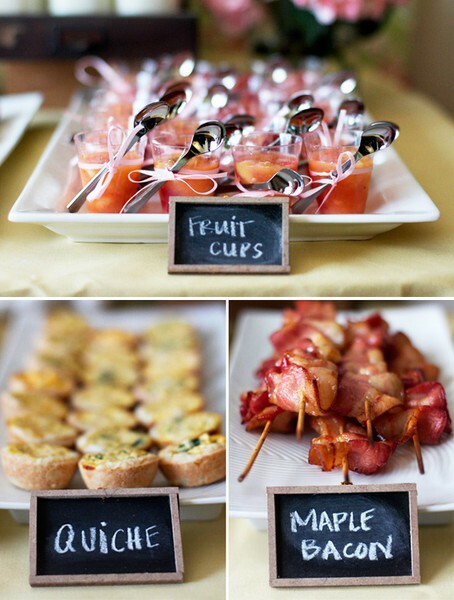 Finger foods and small bites are such a wonderful idea when you know you are going to be up socializing with your closest gals. These tiny bites are definitely cute but can be time-consuming to assemble. 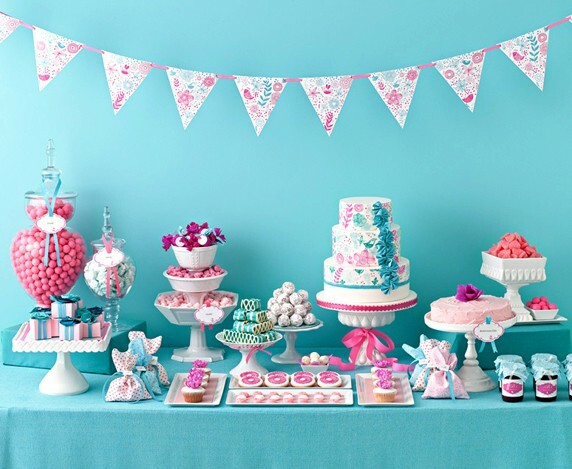 If you have a larger group coming you may want to consider hiring a caterer. However if you are the Martha Stewart type then this should be an easy feat. Just be prepared for an early morning. Just remember that presentation is key. 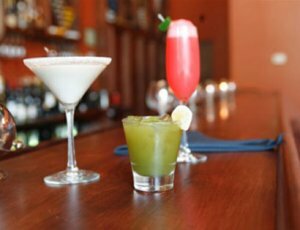 Go that extra mile to do fresh flower arrangements or splurge for real cocktail glasses instead of pink Dixie cups. You may have the best tasting food in the world, but everyone will remember the tiny elements and attention to detail you put into your soiree. By the end of brunch all the ladies will be singing your praises. For a completely different, sweet idea check out The Original Chocolate Bar. I think this is such a cute idea for a girl’s night out activity. 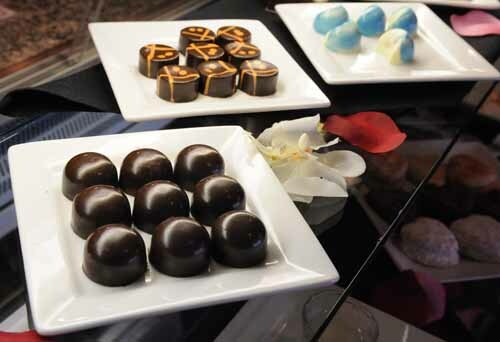 They offer amazing homemade sweets as well as a small menu of normal food. 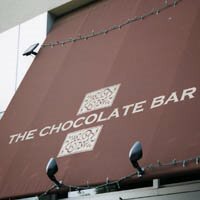 This would be a great place to do gourmet desserts and cocktails. Located of Ponce in Decatur. Please vote for RD Music & Marketing!!! Help RD Music & Marketing reach 250 votes!